I stumbled across this really cool field just outside of Kitchener near Ayr recently in my never-ending quest to find more affordable/accessible accomodation for my RV-4. This field is headquarters to UPAC and home to a friendly group of aviators who enjoy a 1980 foox200ft runway, which, once I brush up on my short fields (I've become way to lax landing on Stratford's 5,000+ runway), I'll be sure to visit. The owner of the field, Ed, is a former Air Canada pilot and both he and his wife fly their planes out of the field. When they're not flying, they've undertaken some very neat projects including a flying replica of the Silver Dart (now on display at the Trenton air museum) and currently an Avro "Baby", a post-WW1 plane which was intended to be an attractive toy (http://en.wikipedia.org/wiki/Avro_Baby) for returning pilots from Europe to buy-few did, but it's a nice piece of Canadian history nonetheless. The current project is tucked away deep in the bowels of an old farm building which can only be accessed by following a guide through a dark building past remnants of airplane parts and an old model T Ford only to emerge into naturally lighted room where it is gradually taking shape amongst a room full of homemade fabrication equipment and airplane parts. Its the kind of discovery that seems right out of a Disney movie-what a sight to see when this thing gets pulled out! There's a small clubhouse where the flyers meet most Saturdays-this is a photo of the flying model of the Silver Dart which occupies a corner of the room. Numerous hangars scattered around the property with lots of hidden treasures like this old Ercoupe tucked away. 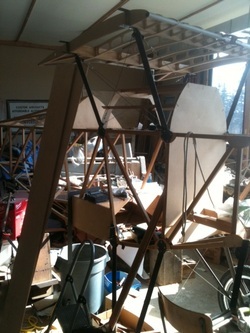 Another of Ed's antique planes in the back of one of the barns.